(CNN) -- The Obama transition team approached Dr. Sanjay Gupta, CNN's chief medical correspondent, about becoming U.S. surgeon general, according to sources inside the transition and at CNN. 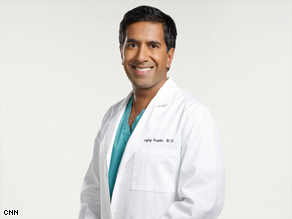 The Obama administration approached CNN's Dr. Sanjay Gupta about becoming U.S. surgeon general. Gupta was in Chicago, Illinois, in November to meet with President-elect Barack Obama on the matter, sources said. The transition team is impressed with the combination of Gupta's past government experience, as a White House fellow in 1997 and a special adviser to then-first lady Hillary Clinton, along with his medical career as a neurosurgeon and his communication skills, the transition source said. The Surgeon General serves as America's chief health educator, informing Americans how to improve their health and reduce the risk of illness and injury. The Office of the Surgeon General oversees the 6,000-member Commissioned Corps of the U.S. Public Health Service, one of America's seven uniformed branches of service. The service works to promote health, prevent disease and advance public health science. The office of the surgeon general is part of the Office of Public Health and Science in the Office of the Secretary, U.S. Department of Health and Human Services. CNN released a statement saying, "Since first learning that Dr. Gupta was under consideration for the surgeon general position, CNN has made sure that his on-air reporting has been on health and wellness matters and not on health-care policy or any matters involving the new administration." Gupta joined CNN in 2001. As chief medical correspondent for the health and medical unit, he is a lead reporter on breaking medical news, provides regular health and medical updates for "American Morning," anchors the half-hour weekend medical affairs program "House Call with Dr. Sanjay Gupta" and reports for CNN documentaries. Based in Atlanta, Gupta also contributes health stories to CNN.com, co-hosts "Accent Health" for Turner Private Networks, provides medical segments for the syndicated version of "ER" on TNT and writes a column for Time magazine. He also anchors the global health program "Vital Signs" for CNN International and is featured in a weekly podcast on health issues called "Paging Dr. Gupta." In addition, Gupta reported from Sri Lanka in the aftermath of the tsunami that swept the region in December 2004. He also helped cover the aftermath of Hurricane Katrina from New Orleans, Louisiana, in 2005. He received his undergraduate degree from the University of Michigan and his medical degree from the University of Michigan Medical Center.